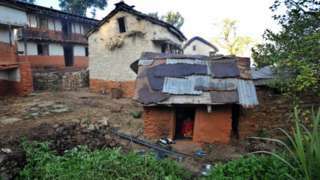 Police in Nepal are investigating the death of a 15-year-old girl who was banished to a poorly-ventilated shed because she was menstruating. They say the girl suffocated after lighting a fire to keep warm. Under an ancient Hindu practice, called chhaupadi, women who have their periods or who have just given birth are seen as impure. It was banned by the Nepalese government in 2005, but still continues in remote western rural areas. The body of Roshani Tiruwa was found by her father last weekend in a stone and mud hut in the village of Gajra, in Achham district, 440km (275 miles) west of Kathmandu. In many cases the huts that menstruating girls and women are banished to are shared with cattle and their excrement and are sometimes some distance from a village. They can be freezing cold in winter and stiflingly hot in summer. It is thought that many victims of the tradition suffer from mental and physical illnesses in later life. The chhaupadi rules mean that a menstruating female faces restrictions on where she can sleep, who she can see, where she is allowed to go and who she can touch. Critics say the government has not done enough to eradicate the practice and that it is has also been slow to prevent child marriages. But officials argue it is difficult to prevent such abuses when they are so deeply ingrained in local culture.